Neil Johnson of Mick George Ltd (left) and Alex Harries from Posh. Mick George Ltd have extended their shirt sponsorship deal with Peterborough United for another three seasons. Posh commercial manager Alex Harris was thrilled the local business has agreed to extend their deal. 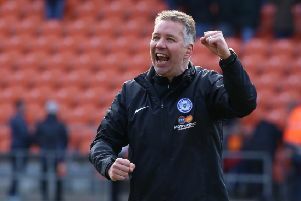 “Everybody at Peterborough United is delighted that Mick George Ltd have agreed to sign an extension to the shirt sponsorship deal with the football club. The agreement will see the Mick George Logo printed on all replica strips, home, away and third kit, worn in competitive action by the club at all levels. This includes the first team, reserve team, and all subsequent youth or academy teams. As with previous years, the partnership will still incorporate a number of other elements such as the ‘Mick George Training Academy’ sponsorship, commercial waste services to all club facilities, as well as numerous additional community and fan engagement offerings. Jon Stump, finance director at Mick George Ltd commented: “We have built a genuine and valued affinity with both the club and supporters since we became the front of shirt sponsor in 2014 and consider that we are seen as much a partner and fellow fan as opposed to just a corporate sponsor. “Through our association with the club, which dates back well before the shirt sponsorship commenced, we have regularly invested in the club supporting The Posh Foundation, The Training Academy at Nene Park and more recently the Chris Turner Memorial Fund amongst others. “We are fundamentally a local business, employing over 1,000 local people who continuously supporting local initiatives whether it be through sport, employment, social or community and be it through commercial partnerships, fund raising or donations.